CoinOpCollectorForum.com • View topic - Where is the serial # on a mills high top 777? Where is the serial # on a mills high top 777? I have a Mills High top 777 in a 25 cent denomination, The mechanism seems to check out as old (if not original). It doesn't have the reproduction indicators listed in this forum, but the case looks completely new with no serial # to be found. Also, the back door looks like a repo, I am sure the lock is. Re: Where is the serial # on a mills high top 777? should be visible with the back door in place. If the cabinet has been refinished, it may be sanded down/covered up; use a flash light along the surface to see any trace of it. In your photo, there is a white spot in that location; possibly sanded off. Also, check the base along the sides. 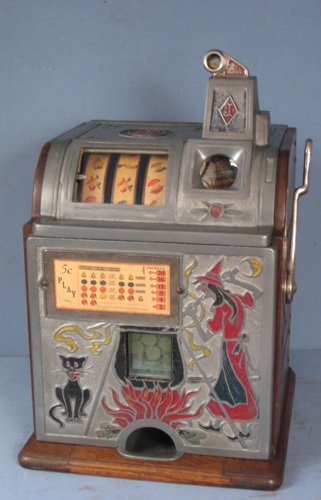 Was this machine sold by Don Creekmore? If so, he typically discloses any repro parts. From the pics, looks legit to me.